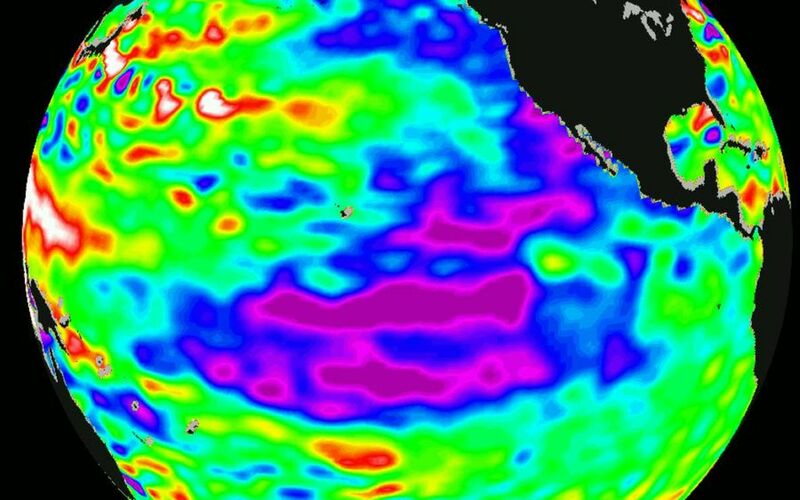 New sea surface height measurements from the TOPEX/Poseidon satellite show that the sea level and temperature of the entire Pacific is "out of balance," including a large area of abnormally cool water along the west coast of North America that scientists say will influence regional weather patterns along the west coast of the Americas this summer. Southern California's seasonal "June gloom" weather, caused by a marine layer that traps smog over the Los Angeles basin, may linger throughout the summer as a result, according to oceanographer Dr. William Patzert of JPL. 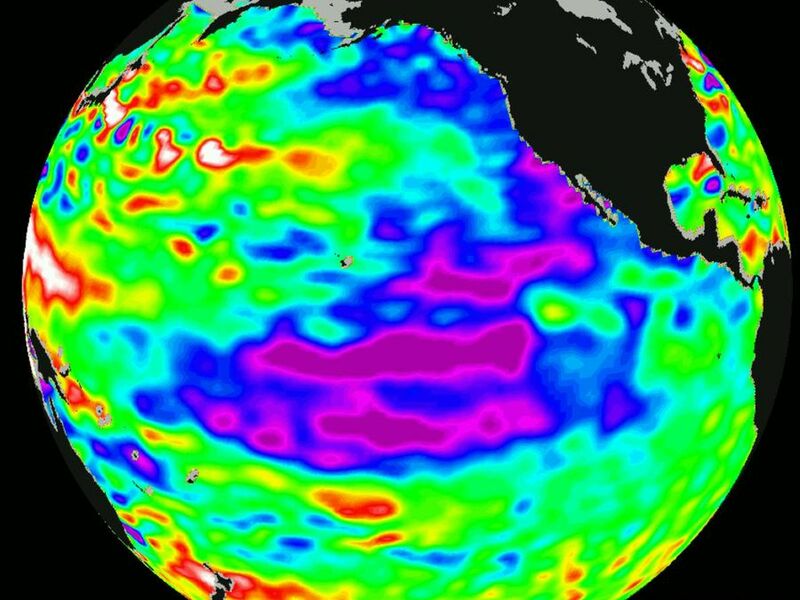 "Our data certainly show that the unusual oceanic climatic conditions that gave rise to El Niño and La Niña are not returning to a normal state." he said. "Our planet's climate system continues to exhibit rather wild behavior. These large warm and cold, high and low sea levels are slow-developing and long-lasting, and will certainly influence global climate and weather for the coming summer and into next fall." The unusually cool water (areas of lower sea level shown in blue and purple) extends from the Gulf of Alaska along the North American coast, sweeping south-westward from Baja California, where it merges with the remnants of La Niña. The La Niña phenomenon's cool, lower sea levels across the equator continue to weaken and break into (purple) patches. The northwest Pacific continues to be warmer than normal, though the variations from normal are not as great as in recent months. Areas where the Pacific Ocean is normal appear in green. The data represented in the image were collected from May 12-22. 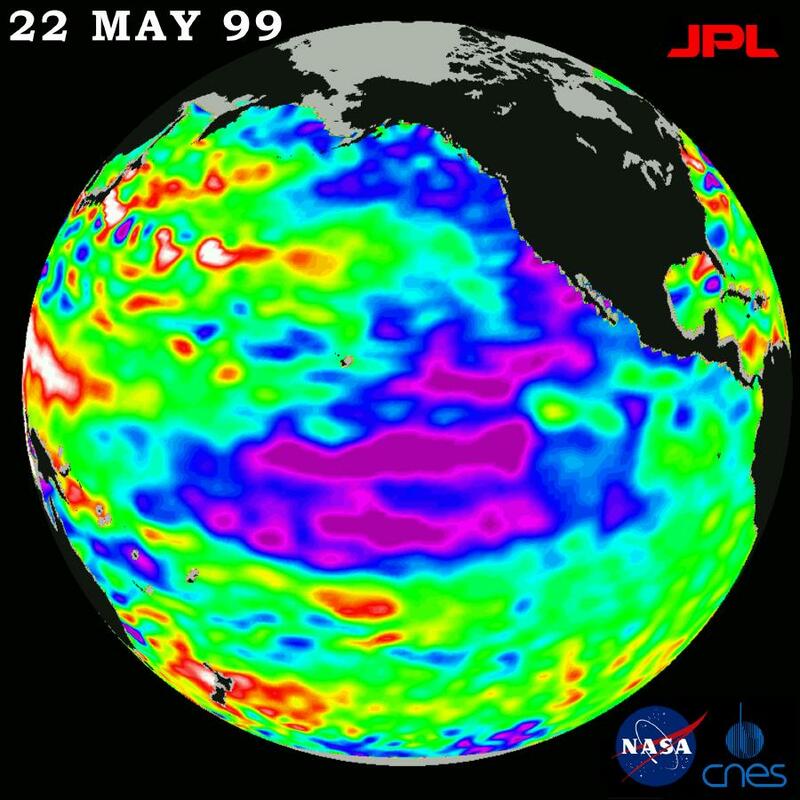 TOPEX/Poseidon's sea-surface height measurements have provided scientists with a detailed view of the 1998-99 La Niña and the 1997-98 El Niño because the satellite's altimeter measures the changing sea-surface height with unprecedented precision. In this image, the purple areas are about 18 centimeters (7 inches) below normal, creating a deficit in the heat supply to the surface waters. The white areas show the sea surface is between 14 and 32 centimeters (6 to 13 inches) above normal; in the red areas, it's about 10 centimeters (4 inches) above normal. The TOPEX/Poseidon mission is managed by the Jet Propulsion Laboratory for NASA s Office of Earth Science, Washington, DC. JPL is a division of the California Institute of Technology, Pasadena, CA.